Good, and I believe this book came onto my reading list at the right time. I fully agree that much of the Church (myself included) has grown content with moseying through life without staking our hills to die on, and then following through on them/making the focus of our lives to grow in, and become more like, Christ. However– Ludy takes forever to get to his main points, and even then, they are obscured in so much purple prose that I'm left floundering to piece together the practical applications. Some editing of his love for adjectives, and cutting at least half of his odd apologies (some of them were weirdly condescending, though I doubt that was the intent) would've been quite helpful to the overall book. I can't get over how awesome this book is. And how desperately needed. Anyone who is or has a brother, father, son, husband, boyfriend, uncle, guy friend who could use some encouragement in being a man of faith--anyone who's gone or is going to churches that leave them cold--tomboys, girly-girls, feminists, and keepers of the home alike should read this book. It has the grit and growls that it so boldly defends, and it will set any Christian immediately on fire for truth and faith. If I had to sum up the book in one sentence, it would be this: What Radical did to motivate and mobilize the church, The Bravehearted Gospel does to fortify the church. The book is divided into seven “parts,” each of which has several smaller chapters. Eric discusses how modern Christianity emphasizes the feminine side of the gospel: “an emphasis on mercy, forgiveness, beauty, allure, relationship, unity, acceptance, and feeling”… all of which is a part of the gospel, to be sure! The problem comes with the neglect of the masculine side of the gospel: “an emphasis on holiness, righteousness, conquering, achieving practical real-world goals, repairing what is broken, the accuracy of truth, the preservation of sound doctrine, and the just need to wage war for the right and to uproot the wrong.” (pp. 47-48)Eric makes no bones about it. He’s not of the Rob Bell-emergent type; he’s 100% for the truth. He calls men and women in the faith to arms – to refuse the “open mind” of tolerance and pluralism and to embrace the “canon mind”… the mind that filters every thought and decision against what the Word says and lives accordingly.One of my favorite chapters in the book is chapter 2, where Eric discusses the life of Job. He showed me many things I hadn’t taken the time to notice about Job before. For example: First, “the land of Uz”–what a bizarre place! But what’s interesting about it is that Uz means “a place of wood.” Second, the name Job means “hated and despised”…The whole book seems strange and a tad bewildering until we realize what it links us to. Where else in the Bible do wood and someone hated and despised get put together in one story? That’s right–the despised King who bore our shame and our penalty upon the wood. (pp. 26-27)That thought sends shivers down my spine! I never looked for the parallel between the story of Job and the life of Jesus… I always thought Job was a kind of “misplaced” book. It wasn’t until Eric explained it that I began to see the similarities.The only detractor I could find in this book is the repetitive nature of Eric’s writing style. He doesn’t say the exact same thing twice, but he does have a way of rephrasing the same concept… two or three times. If that’s something you take issue with, this book won’t be easy for you to read.Overall, I’d recommend this book to anyone, especially if you’ve read Radical. Like I said before, what Radical did to mobilize the church, The Bravehearted Gospel does to strengthen it. We cannot be a solid church if we do not return to the truth of God’s Word and allow it to be the lamp unto our feet. Actual rating 3.5 stars. Author Eric Ludy is concerned about the present state of the church. He feels believers in the western church have more in common with the world than with Christ, so much so that both the church and the Gospel of Jesus Christ have been drained of their power. He contends that the message has been changed to primarily be about the grace of God, while the muscle and power of God to change lives has largely been forgotten. Ludy feels that the western church has been emasculated; "The Bravehearted Gospel" is a call to regain the backbone that has been missing. The author feels that we need to restore the "masculine" side of faith and practice, while balancing that with the "feminine" side that dominates the church now. The book is a call back to radical Christian living and holiness. I feel the book has several shortcomings: 1) This is not a new theme, and it has been done better elsewhere (e.g. David Platt’s "Radical"). 2) In addition, I have some concerns about Ludy’s inclusive language. He often writes, "We do this ..." or "We do that ..." Although I share the author's concern about the state of the church, the problem is by no means universal within the western church. Consequently, his words will feel like accusations to those who are largely living as they should. For the large number of those who are not living as they should, this is the kind of book that will make them uncomfortable. That could be a good thing. 3) Ludy also chose to quote the King James throughout the book. Though he said his reason for doing so would be apparent, it seems to me the book would have been better without it. 4) The author's writing skills are average at best. There are many Christian writers out there who are more gifted. It took me awhile to warm up to what the author is saying because he is being over cautious (he speaks about being religiously correct and he is!) but this aside his message is one of great importance and he doesn't need to be so apologetic about it. I think he deals very well with the truth issue that is involved in todays false interpretation of God's Word and the syncretism that has crept in to the average persons worldview which for some is decidedly unbiblical. I think a book like this is a good wakeup call to see if we are on the right track spiritually regarding issues of truth and faith and a call to align ourselves with the Bible rather than the 'gospel according to me' or some other who have their own version of the gospel for those too lazy to do their own research and study. 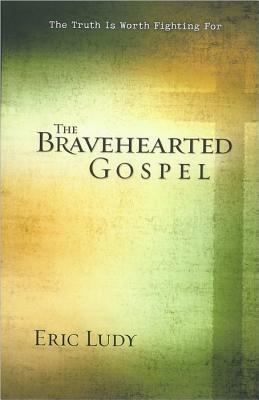 The Bravehearted Gospel is Eric Ludy's tenth book, but it is much different from his others. Far from a mere "When God Writes Your Love Story," book, The Bravehearted Gospel is full of the marrow of Scripture and the grit of rugged, gospel-centered truth. Ludy provides a helpful and compelling biblical worldview that challenges the errant tendencies of the emergent church while still engaging the world in a biblical way. Anyone wanting to engage the world with the gospel will want to read this book. I was torn between giving this a 3 star rating and 4. I chose 4 as the book did redeem itself in it's message. Finally. The bad part is that it took forever to get to the point. I recommend the book highly but take note that the 1st half may slow you down or even stop you. Eric spends so much time apologizing for how he is wording his message he seems to forget to get on with it.However, I will add that surely the 1st half if for the more sensitive of Christian readers. And more to the point women readers. This portion is for you. This book was a little disturbing, not because I thought he was teaching heresy (he's not), but he is extremely judgmental about one of my favorite authors and extremely harsh about some areas of Christianity. I wouldn't say I disagree with him about everything, but I'm very concerned about some of his ideas. This was an average book for me. I agreed with much of what he was talking about. This is a book about being a real Christian man. It was challenging, and made me think about the way churches are run and how ministry is done and How men and women are so different in how they approach Church and ministry. I'm at chapter ten right now and he is FINALLY getting to the substance. He ironically over-apologizes (in order to people please?) for 9 chapters before starting into how Christians need to quit being people pleasers. Granted, I'm not done with the book yet. Great book on how to effect change in your sometimes luke-warm Christianity. A must read! This was somewhat of a hard read for me, and I think I'll have to read it again to fully understand it, but I believe it's worth it. I high recommend this book for men of faith! I loved the message of this book, just not how long it took him to get to it! Still, a recommended read. A tad repetitive at times, but an important read that deals with relevant, convicting, and essential truths for all believers. The first few chapters get a little redundant and too apologetic. But if you can get past that, the rest of the book is thought provoking and convicting. A good book on the importance of truth and holiness. It shows and denounces how in these days truth is often pushed aside because it is not "loving". Excellent book, all Christians should read it to familiarize themselves with the dangerous trends of watering down the truths from the Bible that we are seeing in churches these days. An appeal to live out our faith more courageously. A good challenge to what we're doing with in our faith journey. A worthy and quick read. This is a Gospel Centered version of "Wild at Heart", and thus, in my opinion, much better. Eric Ludy - Eric is a bestselling author, internationally-recognized speaker and president of Ellerslie Mission Society. He is also the senior pastor at the Church at Ellerslie and the lead instructor at Ellerslie Leadership Training in Windsor, Colorado. Ludy is the author of more than a dozen books, many of which were co-authored by his wife, Leslie Ludy. The Ludy's books have sold well over a million copies in the United States and have been translated into over a dozen different languages and circulated widely throughout the world.